Think twice about dumping anything into a storm drain! It is a common misconception that storm drains lead to a wastewater treatment plant, but in many urban and rural settings, the water entering drains receives no treatment and is discharged directly into the closest waterway. Aside from the dirt and pollution that is simply washed off urban surfaces into the waterways, your property may be contributing to water quality issues in local streams without you even knowing. The pollution entering our waterways doesn’t entirely come from illegal dumping; a considerable amount comes from urban and suburban surfaces. As a vehicle owner and/or a homeowner there are a number of things that can be done to minimize the pollution entering our waterways. In many cases water from storm drains collects in large pipes and empties into streams, untreated. Photo credit: Chesapeake Bay Program. 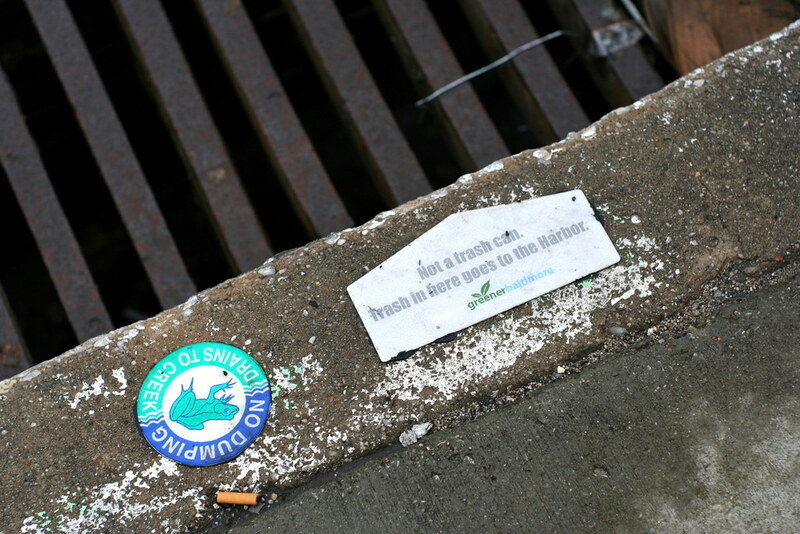 Signage is a common way to let the public know about storm drains. Photo credit: Isaac Wedin.